I'm in the north of the UK and thinking about coming down to my first HPV event in York on the 23 of July. 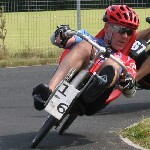 I know I need to add a chain guard to my Silivio Cruzbike to compete. Do I need to register for the event or do I just turn up? Is there a preferred camp site for the night before?? 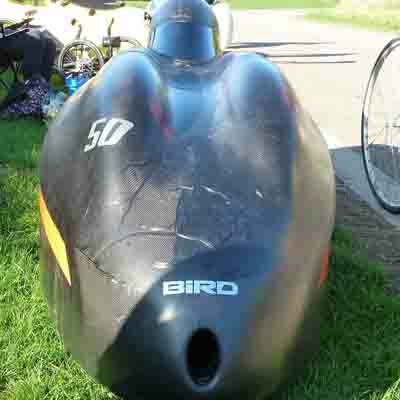 You will need to attach A5-sized numbers to your bike, at least one on the front and one on the side, but the front one is most important, so should be clearly visible. No need to pre-register (you need to sign the entry list before the racing anyway). However, if you talk to Chris, our Competition Secretary, beforehand, he can probably get you put on the system and allocate you a race number. You will also be given timing tags on race day, which are usually stuck to both sides of your helmet. As to camping, I have no idea, but someone may be along in a bit who does know. Arm/elbow pads are quite a good idea too, to reduce grazing if you overdo it in the hairpin! I didn't want to drive down the 200 miles and then find I had a machine that I couldn't race or that I hadn't registered in time! looking forward to having a blast on my recumbent!! camped here before - it's basic, pub in village is good though, but it's wrong side of town if you are travelling from the north. ... But only a couple of miles off your probable route to the circuit if you're approaching York from the A1.